With the expanded range of colors visible to Cassini's cameras, differences in materials and their textures become apparent that are subtle or unseen in natural color views. Here, the giant impact basin Odysseus on Saturn's moon Tethys stands out brightly from the rest of the illuminated icy crescent. This distinct coloration may result from differences in either the composition or structure of the terrain exposed by the giant impact. 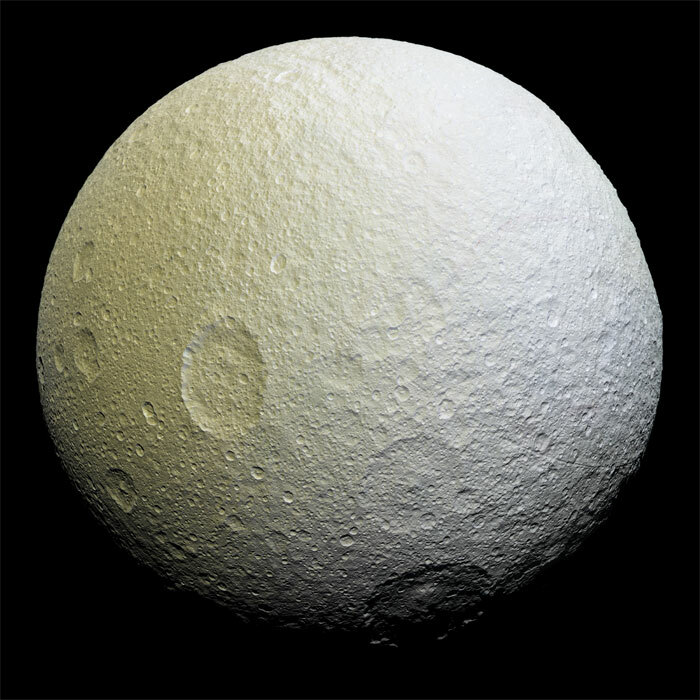 Odysseus (280 miles, or 450 kilometers, across) is one of the largest impact craters on Saturn's icy moons, and may have significantly altered the geologic history of Tethys. Tethys' dark side (at right) is faintly illuminated by reflected light from Saturn. 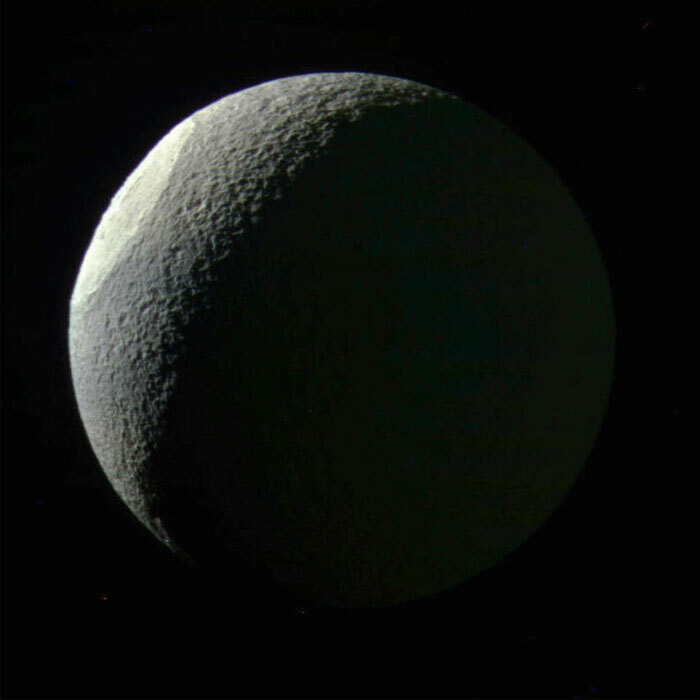 The view was acquired on May 9, 2015 at a distance of approximately 186,000 miles (300,000 kilometers) from Tethys. Image scale is 1.1 mile (1.8 kilometers) per pixel. Unusual arc-shaped, reddish streaks cut across the surface of Saturn's ice-rich moon Tethys in this enhanced-color mosaic. The red streaks are narrow, curved lines on the moon's surface, only a few miles (or kilometers) wide but several hundred miles (or kilometers) long. 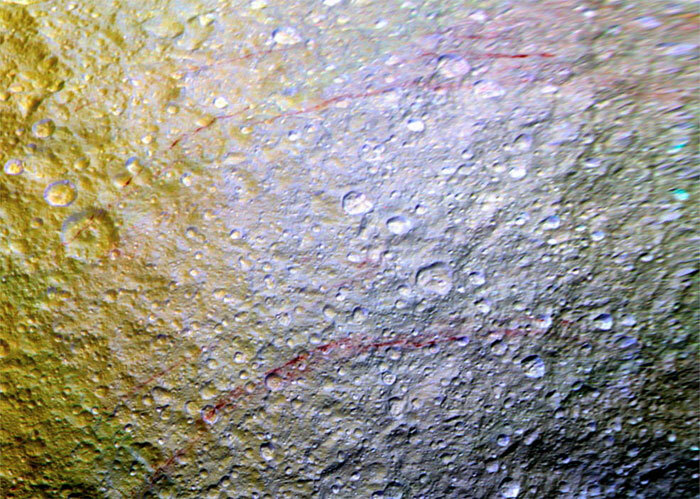 The red streaks are among the most unusual color features on Saturn's moons to be revealed by Cassini's cameras. This enhanced-color mosaic of Saturn's icy moon Tethys shows a range of features on the moon's trailing hemisphere. 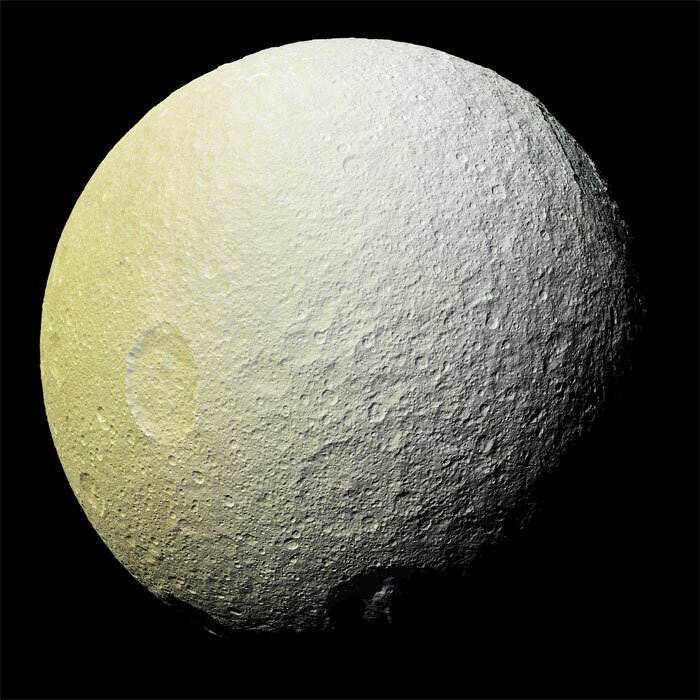 Tethys is tidally locked to Saturn, so the trailing hemisphere is the side of the moon that always faces opposite its direction of motion as it orbits the planet. This enhanced-color mosaic of Tethys shows terrain slightly farther to the southwest than images taken a couple of hours earlier. A version with standard image processing is available, along with a strongly enhanced version.